Captain Richard Lance (Gregory Peck) brings reinforcements to a fort that has just been over run by Apaches. He captures the leader Tucsos (Michael Ansara) but doesn't kill him and brings him back to Fort Wingate as a captive. Lance is going to continue on with Tucsos to another fort but the commander orders him to stay. Lance sends his friend, and romantic rival, Lt. Holloway on the dangerous detail, and Holloway is soon brought back dead. Lance's girlfriend and most of the fort blame him for Holloway's death. Captain Lance takes a small party out to head off Tucsos and guard a pass he must come through. Lance takes the men to an abandoned fort and he tells the man why he took them with him. For most of them it was because they wouldn't be of any use back at Fort Wingate. He has taken all the troubled troopers with him. When the Apaches attack the group of misfits pull together and hold them off. 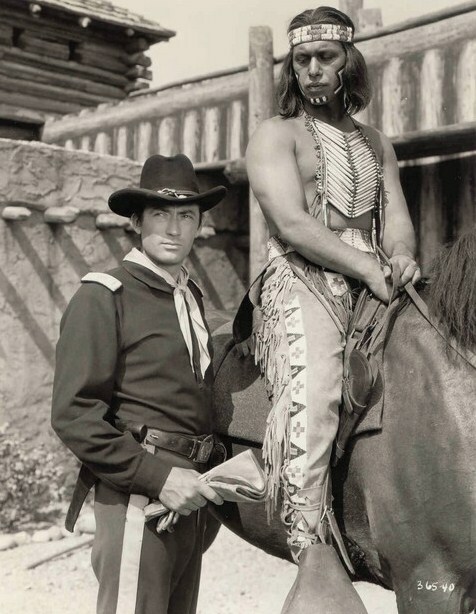 Captain lance and Corporal Gilchrist (Ward Bond) then go out to talk to the Apaches. Tucsos comes out to meet them and says: "Why you come out under pale flag?" When Lance asks him to surrender Tucsos says: "You have strange courage dog soldier." Lance wanted to set off some dynamite to impress the Apaches but one of his own men had sabotaged him and the removed the fuse. Capt. Lance now wants to go back up and reset the fuse the so he can blow up the pass. The Apaches attack and some of the men are killed. The next day Captain Lance heads back up to reset the fuse. The Apaches were going to tie two captured troopers to horse and pull them apart, but they let the two men, a Yankee and a Confederate fight it out. While the fight is going on Lance blows up the pass. Reinforcements arrive and with the help of a Gatling gun the soldiers massacre the Apaches. The Apaches who are left surrender except for Tucsos who goes to find Lance. They fight it out hand to knife and Lance turns the knife on Tucsos and kills him. Good cast with Peck, Ward Bond, Lon Chaney Jr. and Neville Brand. The Apaches don't get much of a chance to give their point of view, and are used mainly to frighten the audience. When they are given a chance to talk it is in broken English and they are not made to sound too smart. Overall not too good of a movie, although it can be looked at as a forerunner to movies like The Dirty Dozen and Kelly's Heros.